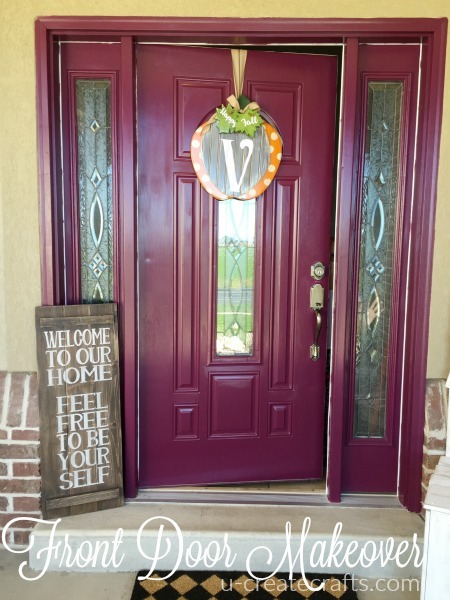 I am so excited to share my front porch makeover with you guys. It was so fun to see the transformation of Kari’s house when she painted her door yellow, that I immediately started on mine too. 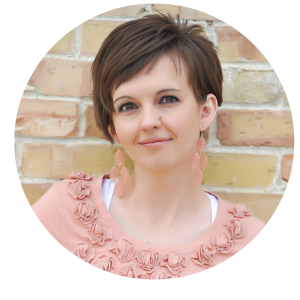 You know those pesky tasks around the house that you keep putting off because it’s hard to find the time? My front porch was one of those tasks. I not only didn’t find the time to give it a facelift, but I also assumed it would be a ton of work…which takes more of my time. I would much rather sew, draw, take a bath, etc. 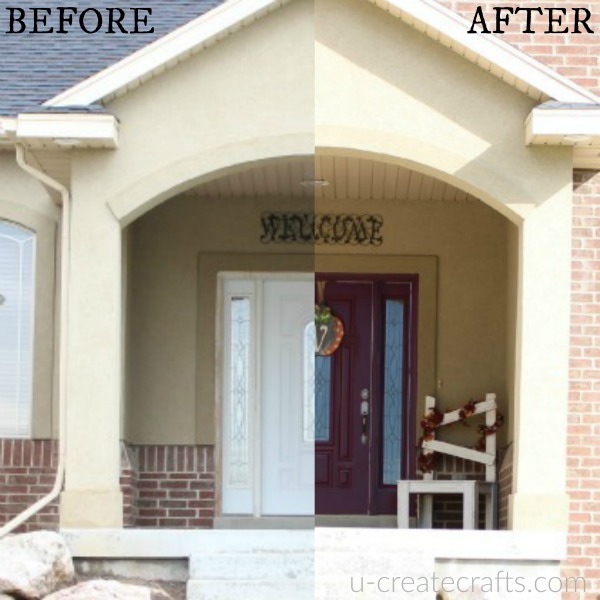 But remaking my front porch really wasn’t a huge undertaking like I thought it would be. Truly all I did was add a pop of color with some paint and some DIY decorations that had been sitting in my basement waiting for me to make them pretty. 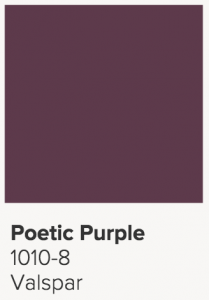 The “pop of color” I chose is Valspar’s Poetic Purple! 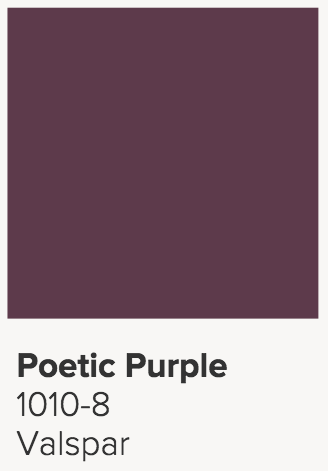 I think it’s such a warm, rich, and inviting color…and I am kind of a purple addict (you should see my purple couches). 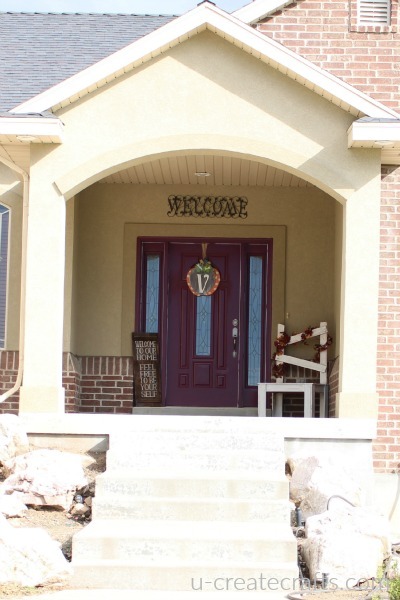 I used the same amazing Duramax Valspar paint that Kari used on her happy yellow door! This is my home. Well, the front porch of my home. We have lots of blood, sweat and tears in this home as we did lots of work in the building process…10 years ago! 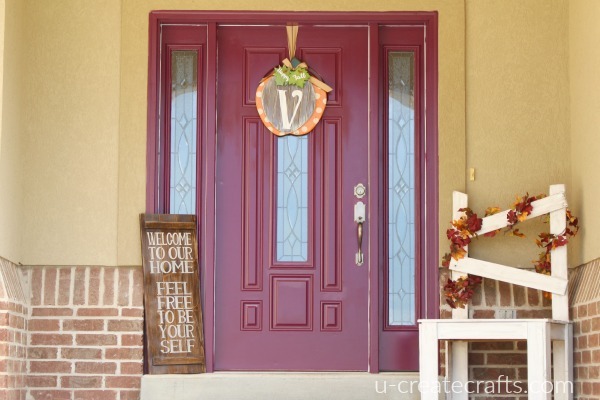 Yep, you read that right…we have lived here for 10 years and each year I promise myself I will beautify my front porch. 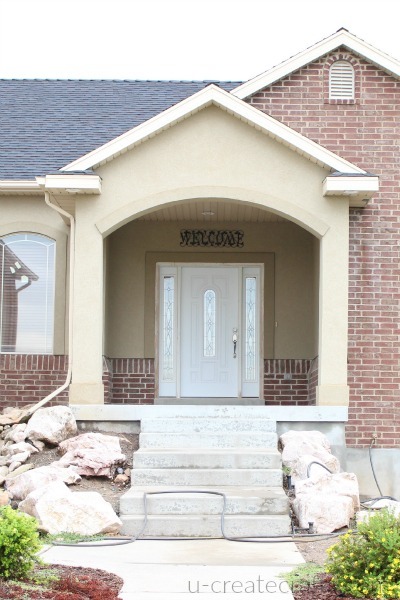 So this west facing door has been hammered by the sun, Utah snow, and 3 kids with friends running in and out. All the while all that covered this metal door was primer. Until now! I sanded the wood with a heavy grit sanding block to remove any of the weathered primer. I also took the sanding block to the metal a little bit; just to make sure the paint adhered really well. I started painting at the top and worked my way down. 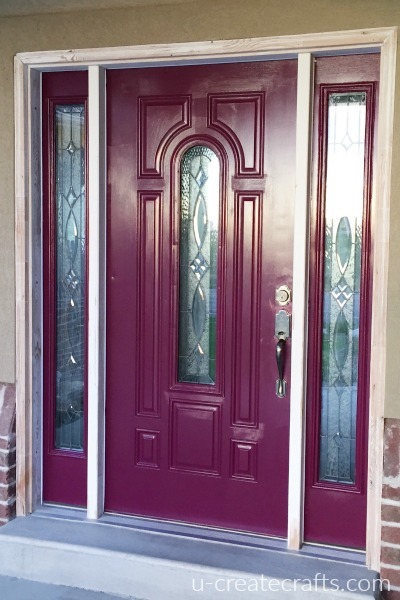 After two coats the door was the perfect shade of POETIC PURPLE. 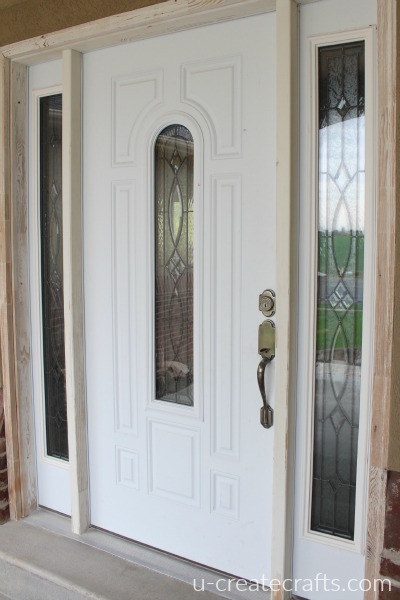 Check out that door. I am in love so far. 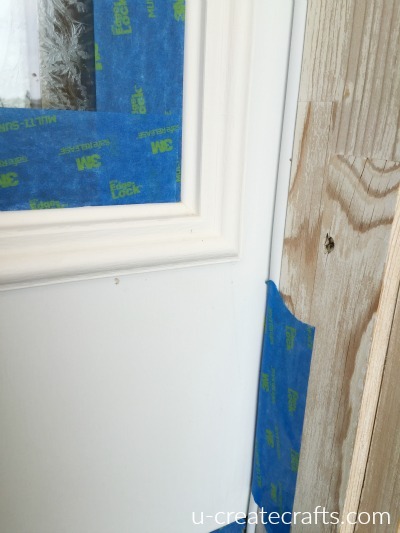 I took the tape off while the paint was wet because I live on the edge like that…and I am always afraid the paint will dry and peel off when I remove the tape. 🙂 I cleaned up the painting stuff and let the paint dry overnight. I live in mosquito-ville and didn’t want to risk any little bugs in my nice purple paint! I added some fun fall decorations and made a Welcome sign. Now I have the front porch of my dreams and I am in love! Do you see that fun chair in the corner? Kari found a woman who makes them out of reclaimed wood; so we bought one and gave it a DIY facelift. 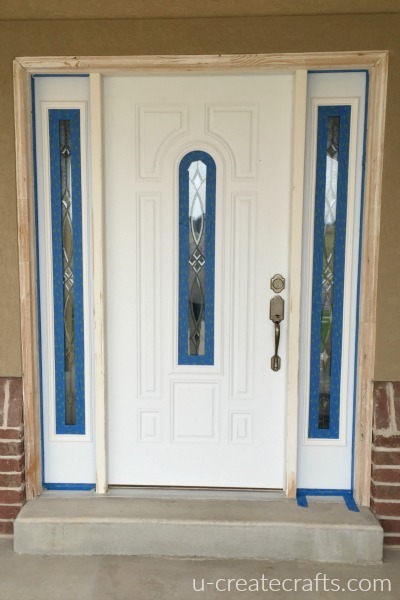 It’s amazing what paint can do… to anything!